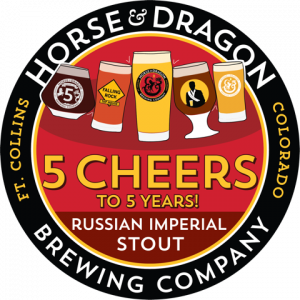 This beer was brewed to celebrate the 5 year anniversary of Horse & Dragon! Brewed with all Colorado Proximity malts. Robust, full bodied, and complex ale with apparent alcohol warming and strong coffee and roast malt character. On 4/17/14 The Mayor of Old Town tapped our very first beers ever sold to the public. A few months later, Falling Rock Taphouse tapped the first of our beers ever presented in Denver during their GABF Tapping Party. This year both The Mayor of Old Town & Falling Rock came and brewed with us (!) — a Russian imperial stout. We’ll be debuting it at The Mayor on 4/17 with all y’all who can make it and cheersing 5 years around the bar. And we’ll be toasting GABF week with the debut of the barrel-aged version (assuming all goes to plan, which is never a sure thing with barrels) at Falling Rock the last day of September. Thank you all who’ve supported our small, independent business — and those that sell our beer — these last 5 years! 5 Cheers! !